When charting large data sets, we sometimes may want to draw attention to the maximum or the minimum value of a dataset, or both. At a glance, it can be difficult to determine the minimum or maximum values in that chart. How can we make it easy for the reader to identify the minimum and/or maximum values? Grid lines spring to mind, but even with grid lines it may still be difficult. In the following I’ll show a few different approaches. 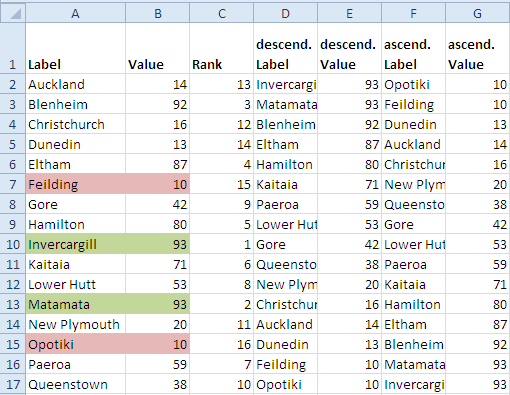 To sort the data, we can use a helper column to determine the rank of each value and then use another helper column to order the values based on their rank. 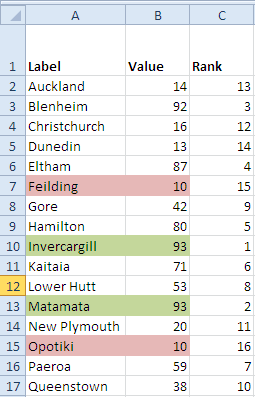 This sorted data will then be used as the chart source. Now it’s very easy to plot a simple column chart based on the data sorted ascending or descending. Note that the solution is dynamic, i.e. when the original data value changes, the sort order will adjust automatically, as will the chart. There may be situations, though, where the order of the data points may not be changed, for example because they are in a chronological order, or because the data points are sorted alphabetically, so they can be seen in relation to other charts with the same alphabetical order. Some alternative charting ideas will be discussed in the following parts.